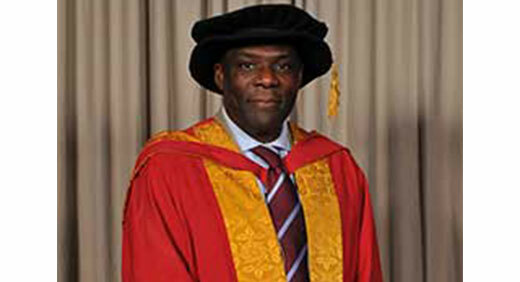 Five-time World Karate Champion Geoff Thompson MBE has been honoured by the University of Wolverhampton in recognition of his impressive record in the field of sport. Geoff is one of the leading youth activists and experts in sports development and politics. He received an Honorary Degree of Doctor of Letters from the Faculty of Education, Health and Wellbeing on Friday, 12 September, recognising his innovative approach to sport and other cultural activities. Geoff has over 25 years’ experience in the bidding, hosting and legacy of major games, and the positive impact of sport and arts in the social and human development of young people and communities. He is founder and executive chair of Youth Charter, a Manchester-based UK registered charity and United Nations accredited NGO. Geoff has written and contributed to a number of publications, articles and theses on the subject of sport for social and human development for peace. He has also established a reputation within the academic world advising, presenting and lecturing to educational establishments. Geoff has been inducted into the Martial Arts Hall of Fame and was honoured in 1995 in the Queens New Year’s Honours list with an MBE for his services to sport.